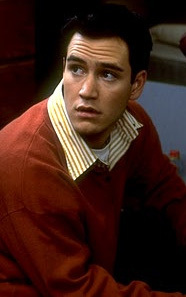 Tim Drake would be best served by Mark-Paul Gosselaar, of Dead Man on Campus fame. Okay, a good archer needs arms like oak trees. And Ollie here's got a rather... exotic look and quiet manner... So Jason Alexander's out. The problem is, my choice has kinda been a real DC hero. And Tipp may kill me for it... but Dean Cain's the call I make. Originally I had thought of a far different actor (Matthew Modine) as Hourman. Pierce, though... Pierce came to mind immediately after seeing the Thomas Crown Affair. It casts him in a bit of a different light than the Bond films do, and he's got the charm needed. The more I try to think of Plas as a young man, the tougher it is and the more his attitude and general demeanor resembles the kind of guy Ben Stiller's so good at. Hey, Alisha's powers enhance her beauty, sure - but she's a knockout anyway -- so is the feisty Catherine Zeta-Jones. Mmm. And... for Warrior... Mel Gibson. Why Mel? Why not? He can be crazy, he can be fun, he can be conversational, he's old enough, he's... Guy.